Bheki Makhubu, the internationally respected editor of The Nation magazine, arrived at Swaziland’s high court this morning in leg chains. 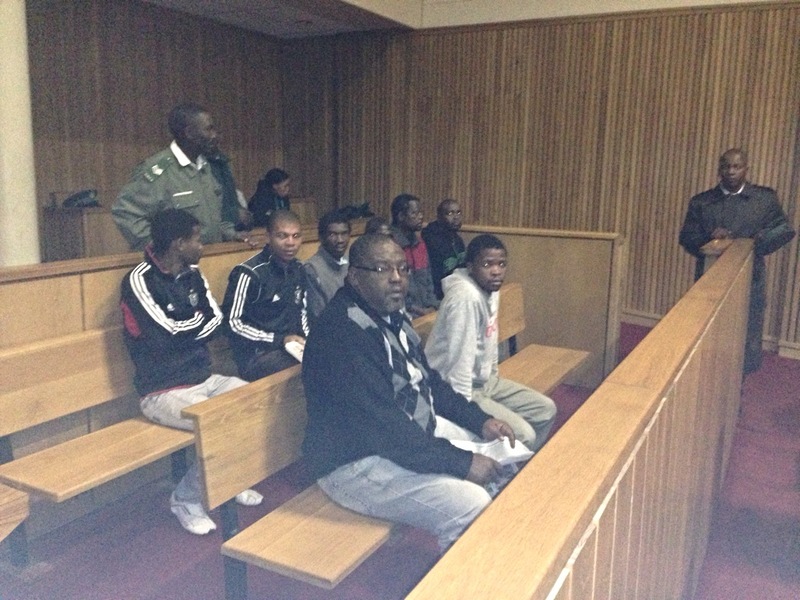 Jailed editor Bheki Makhubu (front left) waits for his bail hearing in the dock of courtroom A in Swaziland’s high court. At the last minute Makhubu’s hearing was shifted to court room B. It is unclear why his hearing was moved into another courtroom. Three serious-looking security guards and several police officers were by his side, watching his every move. A casual bystander, though, might have noticed the natural authority and quiet dignity emanating from the chained journalist. Makhubu seemed in good spirits, all things considered. He has been charged with criminal contempt of court after writing an opinion piece questioning the country’s justice system. For many years he has been calling for the courts to abide by the Constitution, calling for state institutions to live in the spirit of the supreme law. He was expected to re-apply for bail at this morning’s hearing. Makhubu’s lawyer withdrew an initial bail application last Tuesday when he argued that his client should be released and served with summons to appear before a magistrate, in accordance with established law. The judge on that occasion dismissed this argument, effectively saying contempt charges are different and the court in this case had more power to do what it wants. Makhubu’s lawyer, along with the lawyer of his fellow accused — well-known human right lawyer Thulani Maskeo — also argued last Tuesday that the presiding judge, Mpendulo Simelane, should “rescue himself” from the case because Simelane is a potential complainant and witness in any trial that may proceed. No trial date has yet been set, though it appears as if Makhubu and Maseko are already serving a sentence, according to legal observers. The front page of the opinion piece written by human rights lawyer Thulani Maseko. This article landed Maseko in detention on contempt of court charges. 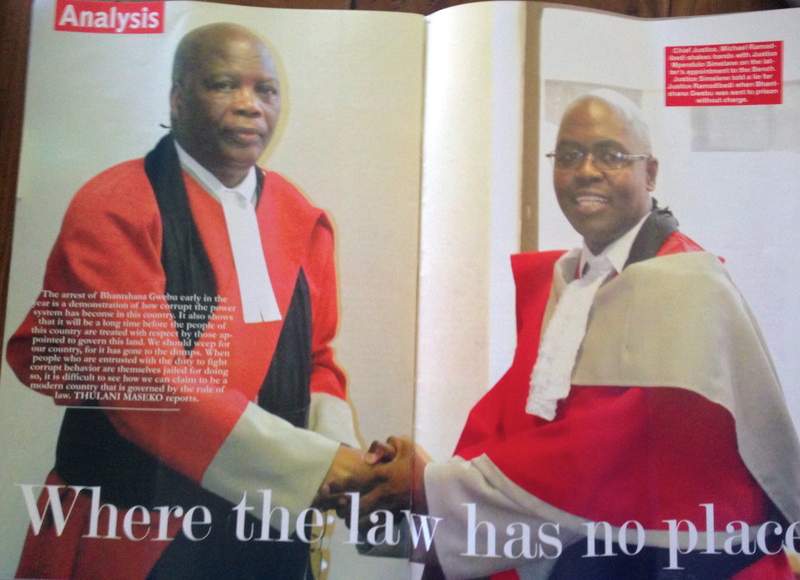 The article makes mention of chief justice Michael Ramodibedi (left), the judge who issued the warrant of arrest and is seemingly a potential complainant and a witness in his own court; as well as newly appointed judge and former court registrar Mpendulo Simelane (right), who presided over the open court hearing on March 25 of Maseko and his fellow accused, journalist Bheki Makhubu. Makhubu is editor of the The Nation, the magazine where the article appeared. Makhubu and Maseko have been detained at Sidwashini jail — just north of the capital Mbabane — since March 18, when chief justice Michael Ramodibedi sent the duo to jail after a closed hearing in the chief justice’s chambers. The detained men were not allowed to defend themselves or apply for bail in that secret meeting, according to their legal representatives. It was also alleged by their legal representatives that the men were physically shoved into the chief justice’s chambers when the accused said they wanted the hearing in an open court. Their crime was to write articles that question the justice system. In particular, they made comments on the case of government vehicle inspector Bhantshana Gwebu, who is also facing a contempt of court charge brought by chief justice Ramodibedi. Gwebu’s crime was arresting the driver of another high court judge, Estha Ota, because the driver was allegedly misusing a government vehicle. Many people have suggested Gwebu was simply doing his job. The articles in question, written by Makhubu and Maseko, also make mention of chief justice Ramodibedi and judge Simelane — the two judicial officers now in charge of Makhubu’s and Maseko’s case. Ramodibedi, an unpopular figure in Swaziland’s civil society, is currently facing impeachment proceedings in his home country Lesotho where he is that nation’s Court of Appeal president. 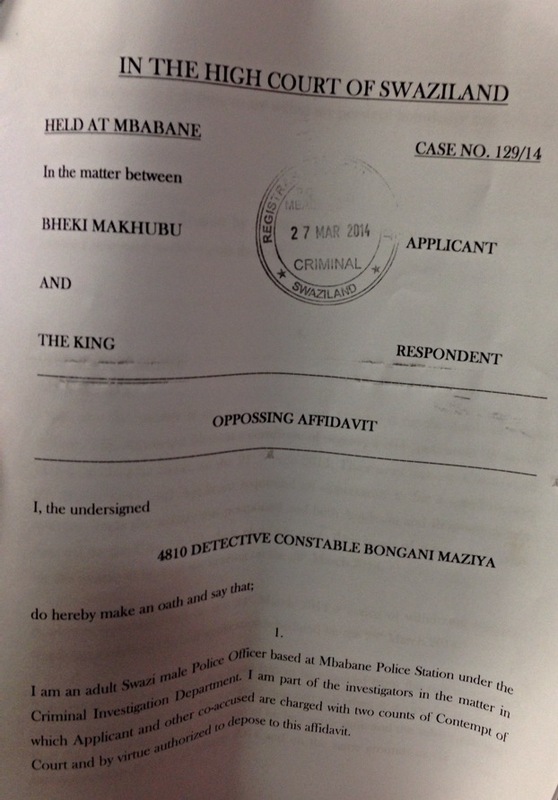 At this morning’s hearing for Makhubu, the Crown — or director of public prosecutions (DPP) — filed an affidavit opposing Makhubu’s bail. However, as far as is known, observers have noted that no trial date has yet been set. The Crown wanted to set a trial date at the open court hearing last Tuesday. On that day however lawyers for Makhubu and Maseko argued that this would go against the established law, not to mention the Constitution, which should see the accused are served a summons by a magistrate and have a fair opportunity to apply for bail in an open court. Section 24 of the Constitution is also meant to guarantee free speech and media freedom. However many people inside the country have noted the increasing fear of expressing an opinion, particularly in reference to the chief justice. Several journalists, especially, are naturally worried that a little slip might also see them in chains. In private, though, many journalists and citizens are craving a more open and free media, where opinions, however unpopular, are respected and debated rather than suppressed and punished. At the court hearing last Tuesday, the lawyers for Makhubu and Maseko also put on record their concern that the High Court is gradually being transformed into a remand court. In another peculiar development, at the last minute before this morning’s hearing Makhubu was shifted from court room A, where judge Mumcy Dlamini was hearing cases, to court room B where judge Simelane — a subject of one of the articles that landed Makhubu behind bars on criminal contempt charges — presided over proceedings. Journalists and court officials were unable to work out why the matter had been shifted from court A to court B. Observers at the court also noted that judge Simelane, going against common practice, didn’t officially remand Makhubu back into custody at the end of the hearing. This left some wondering whether Makhubu was in fact free to leave the dock after the hearing. As it happened, though, police put leg chains back on Makhubu and drove him back to Sidwashini jail under heavy security. Observers at the court were unsure if judge Simelane, a former court registrar and new to the position of high court judge, forgot to follow regular procedure — of officially ordering someone back into remand if bail is postponed — or if another procedure was being followed. Many supporters of Makhubu, who had come to offer moral support to the detained editor, were confused as they left the court. Several members of the public gallery were clearly shocked at the ongoing drama surrounding Makhubu’s detention. Many heads in the courtroom were seen shaking in quiet frustration. Makhubu’s wife was visibly upset outside the court as she is unsure when her husband, a gentle and intelligent man, will be released. Local journalists who attended this morning’s hearing said it now appears that Makhubu and Maseko will both appear at the high court next Tuesday 1 April for a “remand hearing”; and Makhubu alone — as per orders handed down this morning — will appear on Wednesday 2 April for his bail hearing.